Salsa or salad, you decide! Plums, the dark red Santa Rosa variety are once again in season in Kenya. Compared to the ones I have eaten in UK, these plums are very juicy and sweet and a bit tart at the same time. The skin also tastes a bit tart. One of my favourite fruits but unfortunately the season is very short, just about 3 to 4 weeks. Plums are rich in vitamin C and K, fiber and antioxidants. Dried plums are called prunes.While the season lasts, I have been busy trying out various recipes using plums. 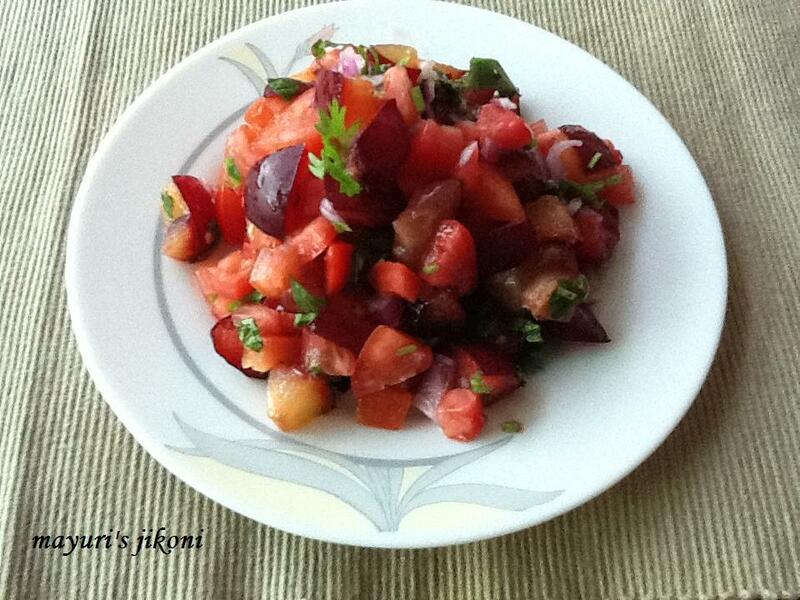 A quick and very easy recipe is plum salsa salad. Have it as a salad or as a salsa with tortilla chips. The sweetness from the plums, the tanginess from the tomatoes and a hint of chilli makes this an exotic salsa or salad. I love to have it a light meal or with sandwiches, soup etc. Remove the seeds from the tomatoes if using the normal variety. If using cherry tomatoes, cut into half. Can prepare ahead and keep in the fridge. However do not add the salt till its time to serve. I used red plums. Any variety can be used. Cut the plums and tomatoes with a very sharp knife to avoid getting them all mushy. If you are going to serve it as a salsa then chop the fruits and vegetable finely.